Virginia Democratic Gov. 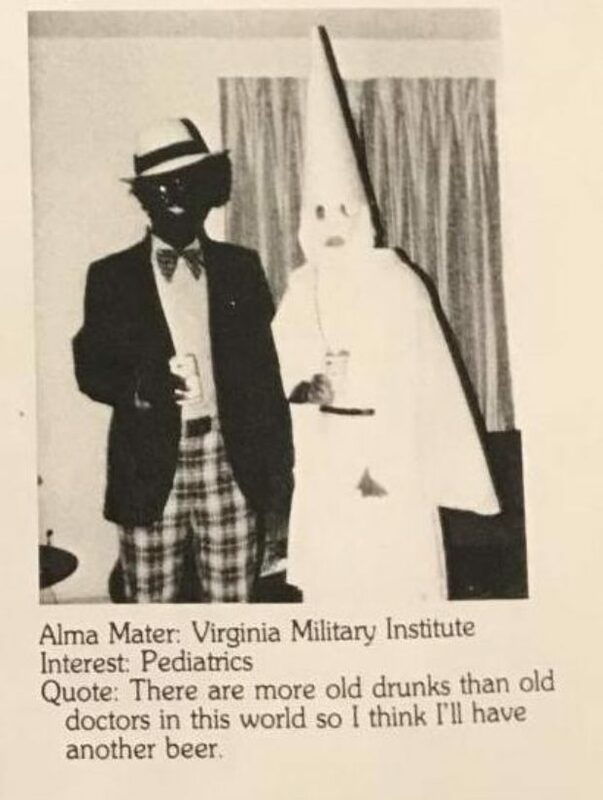 Ralph Northam denied being one of the people in racist photograph that appeared on a page devoted to him in his 1984 medical school yearbook. However, the Virginia governor did admit to using “a little bit of shoe polish” to darken his face that same year in an impersonation of pop singer Michael Jackson. During a Saturday afternoon press conference, Northam again apologized to Virginians for not doing more to ensure the picture did not appear on his page, but vehemently denied being in the photograph. When I was confronted with the images yesterday, I was appalled that they appeared on my page, but I believed then and now that I am not either of the people in that photo. I stand by my statement of apology to the many Virginians who were hurt by seeing this content on a yearbook page that belongs to me. It is disgusting. It is offensive. It is racist, and it was my responsibility to recognize and prevent it from being published in the first place. I recognize that many people will find this difficult to believe. The photo appears with others I submitted, on a page with my name on it. Even in my own statement yesterday, I conceded that, based on the evidence presented to me at the time, the most likely explanation, that it was indeed me in the photo. In the hours since I made my statement yesterday, I reflected with my family and classmates from the time and affirmed my conclusion that I am not the person in that photo. The Virginia governor then described a time when he did darken his face “as part of a Michael Jackson costume” and said it was an example of why he “truly” does not believe he is in the yearbook picture. While I did not appear in this photo, I am not surprised by its appearance in the EVMSs yearbook. In the place and time where I grew up, many actions that we rightfully recognize as abhorrent today were commonplace. My belief that I did not wear that costume or attend that party stems in part from my clear memory of other mistakes I made in the same period of my life. That same year, I did participate in a dance contest in San Antonio in which I darkened my face as part of a Michael Jackson costume. I look back now and regret that I did not understand the harmful legacy of an action like that. It is because my memory of that episode is so vivid that I truly do not believe I am in the picture in my yearbook. You remember these things. I dressed up in a Michael Jackson [outfit]. I had the shoes. I had a glove, and I used just a little bit of shoe polish to put on my cheeks, and the reason I used just a very little bit is that you cannot get show polish off. It was a dance contest. I had always liked Michael Jackson. I actually won the contest because I had learned how to do the moonwalk. Northam later expressed his belief that “there was an agenda involved” in the photo coming to light.